As he neared the ancient city of Damascus, Syria, a great light brighter than the noonday sun appeared unto him and a voice from heaven asked him why he was persecuting him. He asked, “Who are you Lord?” And the voice spoke again and said, “I am Jesus of Nazareth whom you are persecuting.” Saul wanted to know what he must do. Jesus instructed him to go into the city and it would be told him what he must do. When Ananias arrived, he at once stated that his mission was to bring him sight and salvation. Immediately, Saul arose and obeyed his instruction: “Immediately there fell from his eyes something like scales, and he received his sight at once; and he arose and was baptized” (Acts 9:18). “Therefore, King Agrippa, I was not disobedient to the heavenly vision, but declared first to those in Damascus and in Jerusalem, and throughout all the region of Judea, and then to the Gentiles, that they should repent, turn to God, and do works befitting repentance” (Acts 26:19-20). “And now what are you waiting for? 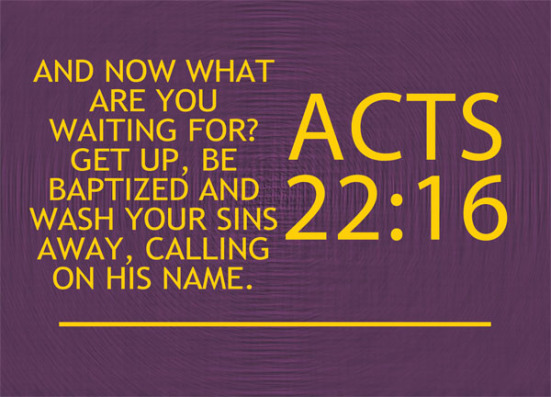 Get up, be baptized and wash your sins away, calling on his name” (Acts 22:16 NIV). If Saul was saved before he was baptized he was saved before his sins were washed away! Jesus said in the great commission, “He that believes and is baptized shall be saved” (Mark 16:15-16). Obviously, baptism preceded by and conjoined with faith, repentance and the good confession of faith is a condition of salvation from past sins.